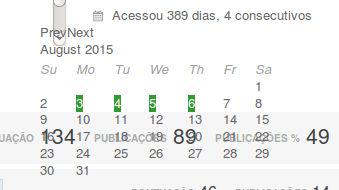 Quando clicamos no calendário que está no perfil, ele fica igual a imagem acima ai. Sei que no Firefox, IE, Edge e Chrome está assim. 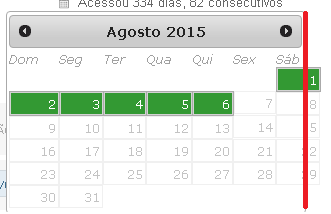 Alguns usuários falaram que o calendário deles está mais louco ainda. status-pronto It's now fixed and will be live after our next production build. A cada letra adicionada é necessário aumentar a largura, pois existe white-space: nowrap que impede as quebras e o padding: 3px 20px 3px 0; que faz o que está a direita ter 20px. No caso os elementos <th> no site em inglês usam 2 letras pra cada dia da semana e no site em Português usa 3 letras. Vou ser sincero, tenho algum conhecimento em CSS, e do meu ponto de vista é um absurdo usar padding-left e padding-right diretamente dentro de <th> e <td> (é apenas a minha opinião). Provavelmente foi algum erro ao carregar o documento CSS do jquery-ui ou outro estilo. Every added "character/letter" is necessary to increase the width because there white-space: nowrap that prevents the breaks and the padding: 3px 3px 20px 0, making the right of the element have 20px. If the elements <th> on the StackOverflow.com using two letters to each weekday and on the pt.stackoverflow.com uses 3 letters in <th>. I'll be honest, I have some knowledge of CSS, and from my point of view is nosense to use padding-left and padding-right directly into <th> and <td> (I hope that does not sound like offense, it is just my opinion). It was probably some error loading the jquery-ui.css document (or other).